3 core strategies underpin monetisation of European gas storage capacity. But strategies are evolving as storage value shifts to the prompt horizon. Storage capacity is a feature of most European gas portfolios. Traders and portfolio managers use storage as a key source of midstream flexibility to manage volume and price risk within portfolios. Storage capacity may be acquired or developed in order to manage inherent ‘short flexibility’ positions in a portfolio e.g. to service retail load swings or fluctuations in gas-fired power plant demand. Alternatively, storage may be contracted purely as a value play e.g. by a trading desk that expects higher seasonal price spreads or spot price volatility. In either case, the hedging and optimisation of storage capacity is typically driven by hub price signals. In today’s article we look at some of the practicalities that drive the monetisation of storage in Europe. 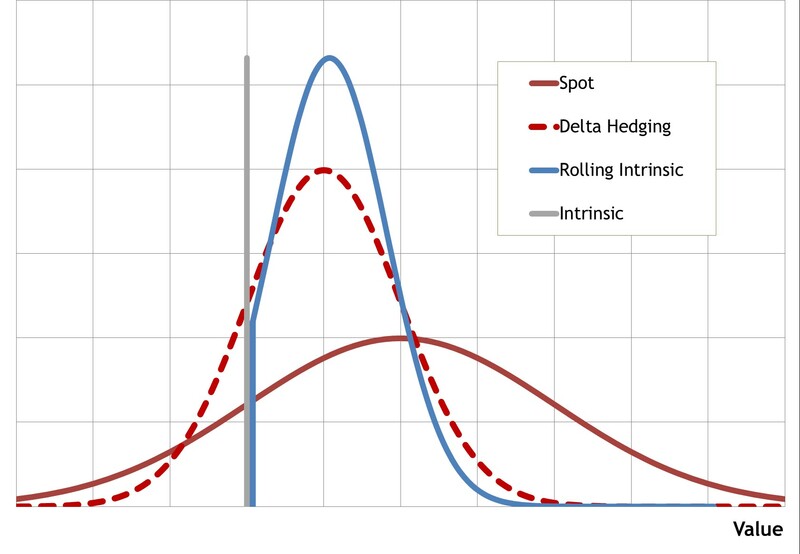 There are three core strategies for the hedging and optimising of storage against hub prices: spot, rolling intrinsic, spot & delta hedging. The risk/return profiles of these 3 strategies are illustrated in Chart 1. A spot monetisation strategy involves optimisation of capacity against current and expected future spot price levels. Under a pure form of this strategy no forward hedging is undertaken. This results in the broader red distribution shown in Chart 1 (higher expected value, higher risk). The advantage of not hedging is that there are no associated transactions costs. The disadvantage is the strategy results in a relatively wide distribution of asset returns (i.e. higher risk). Pure implementation of a spot strategy is rare – it forms one extreme of the spectrum of monetisation approaches. But modelling of spot strategies often provides storage traders with an important benchmark that feeds into their optimisation decisions. Spot strategies are particularly important in capturing prompt price volatility, where storage flex is difficult to hedge given available tradeable products. Probably the most common strategy adopted for monetisation of flexibility value is the rolling intrinsic strategy. Asset flexibility is optimised & hedged against the forward curve, with the owner ‘rolling’ or adjusting hedges if better opportunities present themselves. In other words, re-optimisation and hedge adjustment is only undertaken if profitable (i.e. adjustments are risk free). Most importantly it enables the capture of some extrinsic value on an ongoing (rather than a one off) basis. The owner does not retain any downside market risk as the intrinsic hedges are only unwound if profitable adjustments can be made to the strategy. This strategy results in the unusually shaped blue distribution in Chart 1. Value downside is limited to the value of the initial intrinsic hedge. Value upside beyond this depends on the correlation and volatility of prices. Expected value is however always lower than for the pure spot strategy due to the negative impact of transaction costs (20% value reduction as a broad benchmark). The delta hedging strategy is a more complex approach for the dynamic hedging of storage optionality. But greater complexity does not necessarily mean higher returns. Liquidity constraints and transaction costs are also key practical challenges in implementing the strategy. Under a delta hedging strategy, storage flexibility is optimised against current & expected future spot prices as for the spot optimisation strategy. But probabilistic forward ‘delta’ exposures are also calculated and hedged using linear products (i.e. fixed price/volume futures or forwards) in the underlying market. Forward delta exposures are then hedged and hedges are dynamically adjusted as deltas change with market price movements. The theoretical benefit of a delta hedging strategy is that it targets capture of the ‘full’ option value of storage capacity, whilst reducing earnings risk when compared to a spot optimisation strategy. Delta hedging requires exposures generated by complex analytical tools (which have ‘black box’ characteristics). Exposures generated by these tools depend heavily on the robustness of the pricing engine in representing price uncertainty. If actual price behaviour structurally deviates from the model then large losses can occur. For example, a structural change in summer winter spreads may cause rapid changes to delta exposures and result in losses on existing hedges (outside the expected distribution of values). Defining 3 core strategies helps with categorisation of storage value capture strategies. But in practice traders typically use hybrid strategies that draw on elements of some or all of these approaches. Most storage buyers also purchase capacity for use as a component of a broader physical portfolio (e.g. to manage production flow, LNG deliveries, customer/power plant load). Storage positions are still hedged & optimised against the market. But portfolio considerations also come into play. Rolling intrinsic is the dominant hedging strategy in European markets. This involves placing initial hedges on the summer/winter spread, then optimising hedge positions as contracts cascade. As part of a rolling intrinsic strategy, traders typically exercise price views via leaving open exposure legs (e.g. sell winter, but retain summer exposure to buy at lower price). Risk limits however typically constrain a trader’s ability to carry large open exposures. Faster cycle storage naturally has a more open exposure into the prompt given greater flexibility to respond to short term price fluctuations. Hedging strategy focus here is on capturing the value of prompt price volatility. Delta hedging has a more limited use in practice. Trading desks may use elements of delta hedging to feed into a storage monetisation strategy. But value erosion is a real issue given analytic complexity and the impacts of liquidity/transaction costs (e.g. bid/offer spread costs and the inability to execute hedges at modelled prices given liquidity related slippage). At the start of this decade, summer/winter price spreads at TTF were above 5 €/MWh. For the last 3 years spreads have mostly traded in a 1.0-1.5 €/MWh range. The substantial decline in seasonal price spreads has pushed the value of both seasonal and fast cycle storage assets into the prompt horizon nearer to delivery. The importance of capturing spot price volatility is likely to increase going forward. Increasing European import dependency means that the European gas market will become more exposed to outages and response delays in gas supply chains e.g. via imports of LNG and Russian pipeline gas. The extreme volatility at TTF and NBP across Feb-Apr 2018 is a good example of this. Rising power sector intermittency is also set to translate into greater swings in gas demand as power plants ramp up and down. Storage value capture from prompt price volatility is strongly influenced by the variable costs of cycling. The lower cycling costs are the lower the strike on the spread option between two time periods. This translates directly into a greater number of value capture opportunities and the generation of higher margin from cycling. From a storage monetisation strategy standpoint, an increasing focus on prompt value means a greater proportion of extrinsic vs intrinsic value. That creates a challenge for traders who are pushed towards holding a higher level of exposure into the prompt, with an associated increase in risk. It also creates a challenge for storage asset investors given a higher portion of asset margins are exposed to short term price fluctuations. Where are US exports flowing?